EMMITSBURG, Md. - The USA Rugby Girls High School All-Americans powered by ATAVUS kick off their summer 2016 schedule Friday, July 29, as they take on Rugby Québec's U18 side at Mount St. Mary's University. There will be two GHSAA teams competing in Maryland - a U16 side has also been assembled - and Head Coach Farrah Douglas has named the 23-player squads for both. EMMITSBURG, Md. 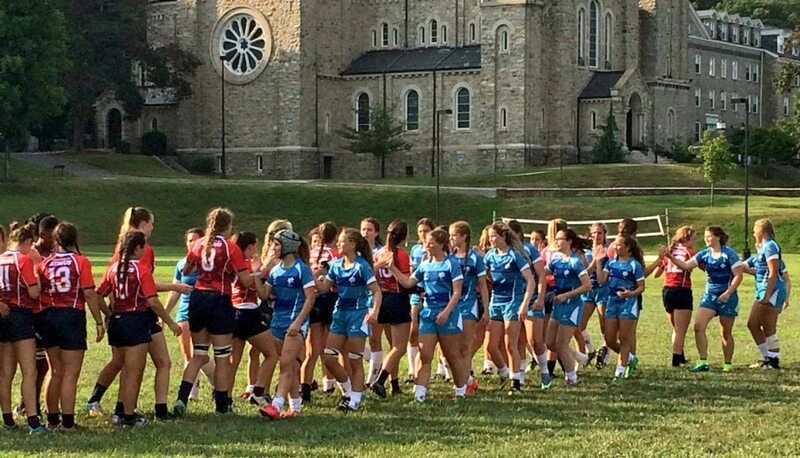 - Both USA Rugby Girls High School All-Americans powered by ATAVUS squads won their first matches against Rugby Québec opposition Friday, with the first-ever under-16 team victorious in shutout fashion, 71-0, and the under-18s conceding a single try in a 48-5 final. The U16s' match kicked off on the grounds of Mount St. Mary's University first, with Fane Haungatau dotting down her first of three tries on the day in the opening minutes. As the score suggests, the GHSAAs piled on the tries in the first half. Full back Salote Tausinga scored two of her own to bring the halftime score to 40-0, and added her hat-trick score in the second half while helping to set up teammates for the additional tries. Fly half Alexandra Dimarco converted eight of the 11 tries scored, and did not have to bring out the tee for penalty goal attempts as the U16s controlled the match. Not long after the final whistle between the U16 sides, the "senior" GHSAAs took the field and went about their business similarly. Continuing the trend of effective full backs, No. 15 Delia Hellander put the GHSAAs in an early lead they would not relinquish over the course of the match. Inside center Emily Henrich scored the second - her first of three five-point plays - and Rugby Québec finished off the match by getting on the board for a 48-5 final. The GHSAAs end their stay in Maryland Sunday, July 31, with two more matches against their Canadian opposition. Follow @aarugby on Twitter for live match updates.